Victoriaville, QC. 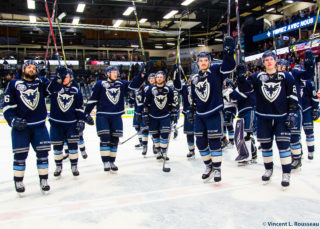 – For the first time this season, the Phoenix were in Victoriaville for a meeting with the Tigers. Prior to Friday’s game, the Birds were 3-0-0 against Victo, limiting them to a combined two goals in the trio of games. While the defence, accompanied by Dakota Lund-Cornish in goal, were able to lock down, the offence failed to produce more than a single goal in the 2-1 loss to the Tigers. 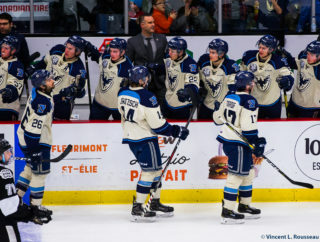 Sherbrooke, who are coming off a frustrating loss to the Blainville-Boisbriand Armada were looking to get the ball rolling again but simply could not find their rhythm at the Colisée Desjardins. Dakota Lund-Cornish did his part, keeping his team in the game stopping 25 of 27 shots, including a highlight reel save to deny Egor Serdyuk, earning himself the QMJHL #PlayOfTheNight. On a 4 on 3 power play, Tigers defenseman, Dominic Cormier, skated in toward goal before sliding it across to Serdyuk who released a one timer but was robbed by Lund-Cornish who sprawled to make the spectacular glove save. Feliks Morozov found the back for the net for the Tigers at 12:12 of the opening period to give the locals a 1-0 lead. 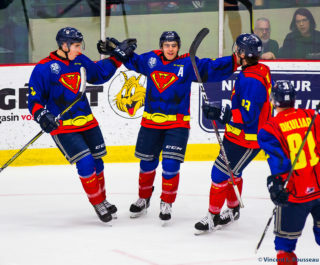 It was not until the third period until the fans in Victoriaville would see another goal, when Patrick Guay buried his 12th of the season off a wonderful feed from Samuel Poulin. The newcomer, Anthony Poulin, regained the lead for the Tigers just minutes later however, banging home a rebound for the game winning goal. 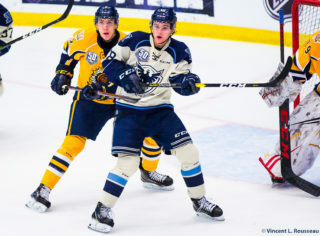 The Phoenix take on the Drummondville Voltigeurs at home on Saturday at 4:00 p.m.